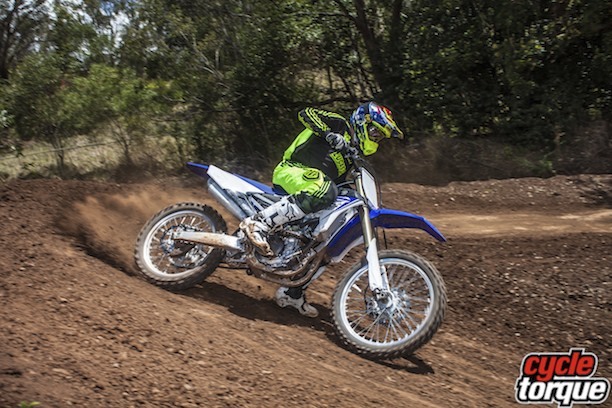 YAMAHA has aimed to set a new benchmark for all 250cc four-stroke motocross bikes with its new YZ250F, which is essentially all new from the ground up. To stand out in the ever changing 250cc MX market the bike has to be real good. The 2014 YZ250F is real good. Lots of manufacturers like to say their bike is all new but besides the obvious styling and reverse head, the 2014 machine really does look very different to the previous model. Yamaha’s vision was plain and simple, make the fastest and most reliable 250cc four-stroke motocrosser on the market. 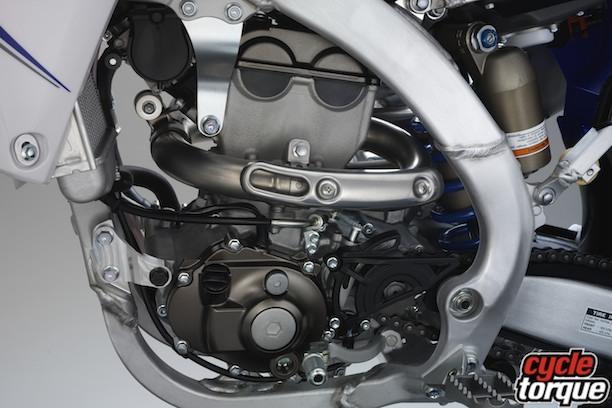 Beginning with a clean slate, the Yamaha engineers used a reverse cylinder engine design, very similar to what can be found on the successful YZ450F. Exactly why the 250 didn’t get the reverse head treatment at the same time as the 450 is open to conjecture but our take is Yamaha wanted to see how the bike would be accepted by buyers before going in boots and all with two models. This design allows for the Airbox and Keihin fuel injection system to be mounted at the front of the engine, allowing for a very straight intake tract, and a massive boost in engine performance. The exhaust exits out the rear of the cylinder, before wrapping back around the front of the engine and continuing out the rear in a more conventional style. A new DOHC 4-valve head was developed to match the new engine, creating a more efficient combustion cycle, which also adds more horsepower. Also new, is the ability to connect the GYTR Power Tuner. The power tuner is a small electronic handheld device, which connects to the engine management system. This allows the rider or mechanic to alter the fuel and ignition settings without the need of a computer or any advanced software. Using 10 different types of forged, cast, and extruded aluminium sections, the new YZ250F chassis has quite a complicated design which aims to provide the ultimate balance of strength and rigidity. A larger front axle has also been introduced to increase front end stability, and when coupled with the new chassis design the new generation YZ now handles better than ever. 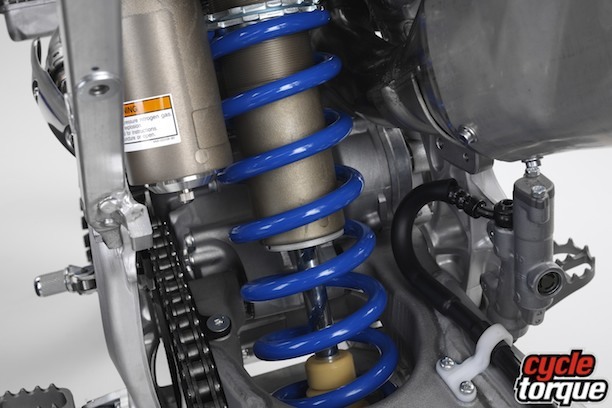 One of the few things that isn’t new and groundbreaking is the KYB suspension. The twin chamber speed sensitive spring forks are very similar to what we have seen on the previous model YZ250F and are some of the best front forks to roll off the production line. 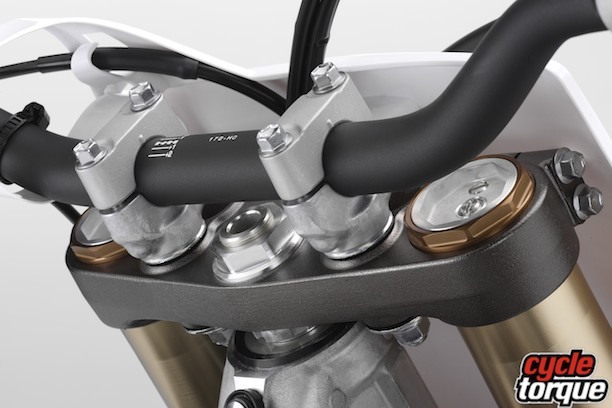 The rear shock is also quite similar, with an updated shock body that now positions the bladder and clicker adjuster on the left hand side of the bike instead of the right hand side. The internal valving spec has been updated in both the fork and shock to match the new chassis characteristics. All new bodywork finishes off the YZ250F, which are not just for looks but also have some function. The new graphics are integrated into the airbox and radiator shrouds do a great job of scooping in that all important fresh air, whilst still looking very cool from the outside. The fuel tank is mounted further back which helps with Yamaha’s mass centralisation concept, neatly tucked away under the seat. A small piece of the seat unclips at the front of the bike to allow for easy re-fuelling. The bike certainly lives up to the hype from the moment you roll out onto the track. The engine is sharp and responds quickly, whilst the chassis and suspension give a very stable feel right from the get go. You still get that ‘Yamaha’ feel, but in an all new vibrant kind of way. The controls are all the same as in years gone by, and with a few personal touches like adjusting the handlebar and lever position we felt very comfortable in the cockpit. The Yamaha technicians set the sag (rear shock spring preload) at 102mm and we were away. Once we warmed up a little bit and started pounding out a few laps, it became impossible not to notice how good the new engine is. It has a very broad spread of power from bottom to top, and with a flick of the clutch any old rider will be able to grab handfuls of power at almost any RPM. In particular the YZ feels very strong through the mid and when you start feeding it some higher revs it really shines. For us the standard gearing was a little bit off and we sometimes found a big gap in between second and third gear. 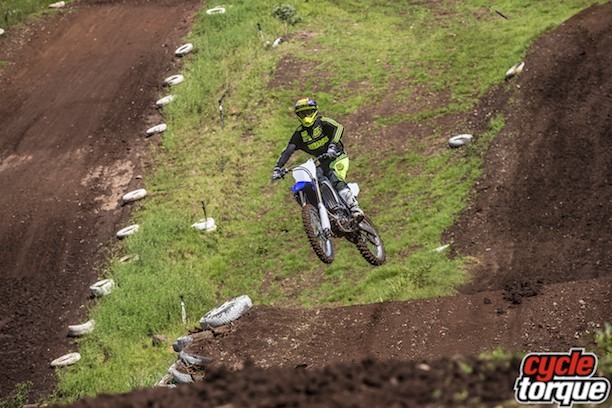 Depending on the rider you could easily combat this by going up or down a tooth or two on the rear sprocket, just as Serco Yamaha’s factory supported 250 rider Luke Clout did on the day of our test. Yamaha boasted it had spent a lot of time developing the exhaust and EFI settings to conform to the strictest noise and environmental pollution policies of the modern motocross world, it claimed to have done this while still maintaining maximum engine response and horsepower. This is a line that some of the manufacturers pull, and as soon as you jump on the bike and wind up the power it feels like someone left a rag stuck up the exhaust pipe. Not so on the new Yamaha, all the development has paid off, so fair enough, the company reps deserve to be able to brag. The engine is very responsive and feels as good as any race-tuned rocketship. Early reports even have aftermarket exhaust companies struggling to outperform the standard system. Once we got past the fun factor of having a blazing fast, small bore high revving engine, it was quickly apparent that all these claims about increased stability and turning weren’t just some fancy words thrown together for a new brochure. This was for real. Our test track proved to be quite the proving ground for the new YZ, with lots of ruts and bumps forming during the day of our test. Throughout the entire day, the YZ was always predictable and very manageable through all the conditions that came our way. The front end was very stable and we had quite a good feel through the front end. We slightly stiffened up the front fork to hold it up better on some of the downhills and on harder landings, but it was only a few clicks that made the difference. The YZ turns very well and was it was a breeze to steer the small bore Yamaha in and out of any ruts and berms we could find. The rear shock works very well and we never had to make any major adjustments. The back end tracks well and stays planted to the ground for maximum traction when you need it. It has been a long time coming but the new generation YZ250F is finally here, and you can buy one for $10,999. We knew this was going to be a good bike, but after our first ride we came away even more impressed that we thought. Yamaha has come up with a very complete package and the bike shines in almost every area possible. 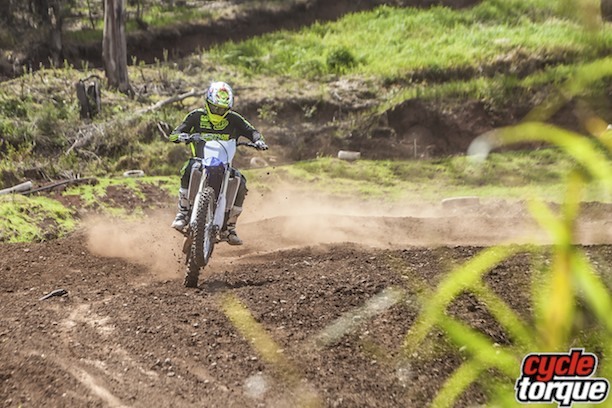 With great power and handling, the YZ is both comfortable and confidence inspiring. If anyone is in the market for a new 250cc four-stroke, it would be very hard to look past Yamaha’s latest offering. If anyone from Yamaha is reading this, feel free to send a YZ250F to the Cycle Torque garage.